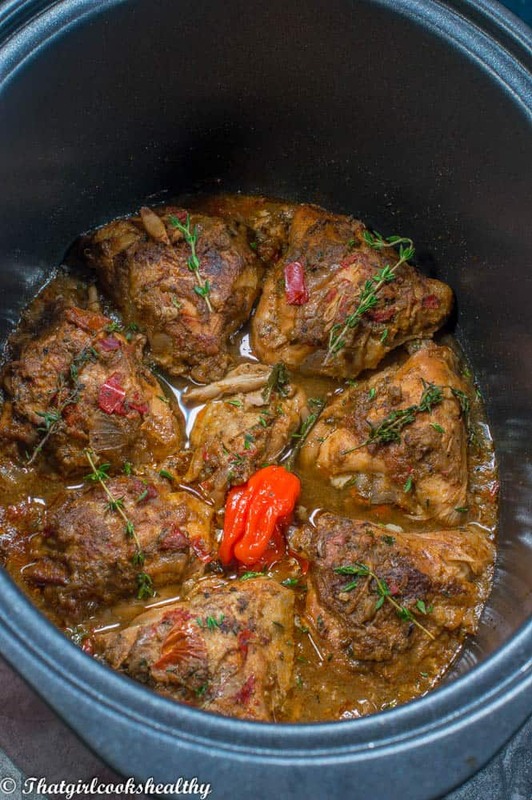 Trinidad stew chicken recipe – succulent melt in your mouth, flavoursome chicken stewed in a slow cooker. Great for busy weeknights or to simply batch cook. I think its high time that I made another Caribbean chicken recipe. This recipe is from Trinidad and Tobago (the clue is in the name). Trinidad stew chicken is packed with true island flavour. Moreover, the meat is so juicy and beyond tender. 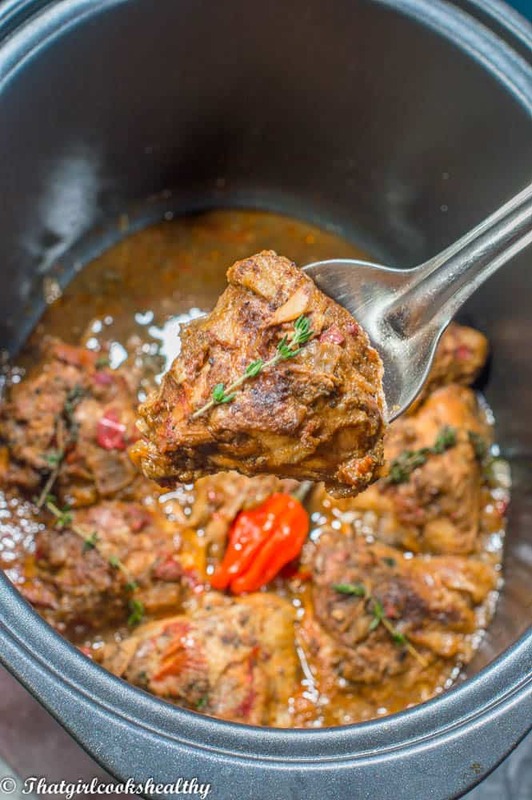 I promise this Caribbean stew chicken dinner will be on your hit list and great to serve if you’re hosting a party or simply for the family. Some of my closet family friends hail from sweet T and T (Trinidad and Tobago). 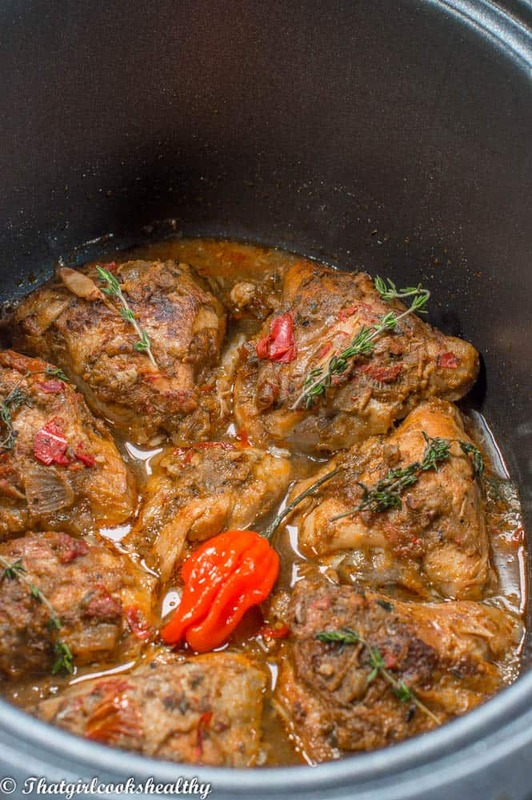 Even though Trinidad and Tobago is a Caribbean neighbour of Jamaica, like many islands, they have a unique way of preparing stewed chicken. In respect to this recipe, Jamaica shares many of the same ingredients excluding the green seasoning and pimento peppers. That’s where you can see a clear distinction in the Trinidadian way of making stewed chicken. I’ve grown up preparing stewed meat in a dutch pot (dutchie/dutch oven) and while I still fall back on this method for cooking meat dishes I have during the past few years incorporated my crock pot. I’m a huge fan of making meat dishes in a slow cooker because they really accentuate the flavours. Believe me waiting a minimum of 4 hours for some chicken thighs is well worth the wait in gold. I’ve made this recipe several times now rotating between conventional cooking and the slow cooker. However,I do enjoy it much more using the latter, so much that I can’t wait to share this wonderful recipe with you. This is made using three main steps – prep (adding the ingredients to the meat to marinate), searing and cooking the meat. Preparing the meat to marinate – Typically chicken pieces are used but I like to use chicken thighs. What I do is trim most of the fat from the thighs so there’s an even balance of fat with lean meat. If you want leaner meat then simply cut all of the skin from the thighs. Ideally, you want chicken that’s on the bone so it doesn’t fall apart. On the bone chicken really works best with this slow cooker recipe. You will need to use your hands to work the main ingredients into the meat. It may seem like a lot but it will result in flavoursome food. The meat needs to marinate for at least 1 hour or overnight preferably. DON’T let the sugar burn or it will taste bitter, it’s very very important that you follow the above step carefully. Searing the meat – The chicken will brown somewhat thanks to the caramelised sugar. It takes about 15 minutes to seal and darken so make sure each side is seared. Because I removed most of the fat my meat didn’t sear as much as it could do. If you are working with leaner meat, don’t be alarm if it doesn’t darken much, that’s normal. Cover the skillet with a lid to seal in the heat. The meat will form it’s own juices, normally I would increase the heat to high to cook the liquid off but this extra meat juice is beneficial to our slow cooking process. Do I need to make a slurry? No, because there’s so much volume to this recipe, there’s no need to make a thickener. It should thickened up without any intervention. What is Caribbean green seasoning? I don’t have access to pimentos, what is the alternative? Pimentos are sweet cherry peppers (not to be mistaken for Jamaican pimento berries). They are a very mild chilli that are sweeter than bell peppers. You can quite easily substitute with a red capsicum instead. Can I make this recipe on the stove top too? Add the chicken, stir and cover with the lid – brown each side of 5 minutes. Turn the heat up to high to make the excess water evaporate, still turning the chicken. Reduce to medium and pour in the excess water. Cover and allow to cook for 30 minutes. Add all of the ingredients and combine with the chicken excluding the water, pink salt, oil and sugar to the bowl. Heat the sugar through until the granules turn into a slightly golden caramel ready for browning the meat. Place the chicken thighs in a large bowl. Add the onion, chives, tomato, green seasoning, tomato paste, garlic cloves, ginger, aminos, black pepper, scotch bonnet, pimento peppers, celery and thyme to the bowl with the chicken. Use your hands to work the ingredients into the chicken until fully combined. Allow to marinate overnight or for at least hour in the refrigerator. Melt the coconut oil in a skillet on medium heat then sprinkle the coconut sugar into the pan. Mix the coconut oil into the coconut oil until the heat turns the granules into a golden syrup. Quickly add the chicken thighs to the skillet, rock the pan back and fourth so the caramelised sugar spreads evenly underneath. Keep the bowl of residue from the marinade!! Cover the pan and allow the first side to brown for 5 minutes. Once browned, turn over the chicken, cover the pan and allow the other side to brown. Once both sides have browned, remove the lid and proceed to cook for another 5 minutes, turning frequently. Mix the residue from the marinade with the hot water and pour into the base of the slow cooker. Hi, my mother is law is from Trinidad and she makes this dish quite often. I was looking for a healthier version of this recipe. Thanks so much for posting one. I can’t wait to give it a try! I wrote the stove top version within the post but I will post it here for you to reference. Use the same ingredients and measurements as stated only using a dutch pot. Hi Charla, I was just reading your entire post and I saw the recipe for the stove version in there. Silly me! I was going to read the whole thing once I was ready to make the recipe. First I gotta head over to the market in order to get the ingredients. The scotch bonnet pepper can be hard to find around here where I live, so I will either have to substitute or order it through your link of ingredients from Amazon. Yeah, I think that is what I’am going to do because I really want the authentic caribbean flavor. Thanks for posting such an awesome recipe Charla! I hope others will appreciate how special it’s! I don’t think you can purchase fresh scotch bonnet online but you can use a fresh chilli or chilli powder as a replacement. That should work just fine. Feel free to message me if you need any more assistance. This looks so good. Thanks for sharing this wonderful recipe.